USC could be interested in Franklin, but would he go? This is the final week of the regular season, so the silly season — the rumor mill and speculation season with regards to coaching moves — has already started. If I had to guess, I’d say James Franklin will be Penn State’s coach for 10 more years. At least. He’s not going to the NFL. Bad fit. So, where would Franklin go? And why? Well, one of the possible answers popped up late Saturday night: USC. Los Angeles. The glitz and glamour of Hollywood. When USC lost to UCLA, which is awful this year, most seem to think it sealed the fate of Trojans coach Clay Helton. The school, and Steelers legend turned AD Lynn Swann, probably will be looking to get rid of Helton and bring in a fresh, exciting face. This may offend some Penn State fans, and for that, oh well. But USC is a better job than Penn State. That’s my opinion, yes, but it’s also the consensus opinion of college football experts who consistently rank USC as a better job than Penn State. USC generally is in the top five of any coaching rankings list, while Penn State isn’t even the top 10 of many said lists. Now, would USC be a better job for James Franklin specifically? My answer is no. Regardless, that doesn’t mean USC wouldn’t be interested in Franklin. And he very well could be interested in that prestigious job. Some of the top college football reporters in the country already have linked Franklin as a potential candidate at USC, including Pete Thamel of Yahoo Sports, Bruce Feldman of FOX and Adam Rittenberg of ESPN. These are smart, well-connected folks, and they’re not just throwing darts in the air without having some basis for it. I’m not going to sit here and try to assume I have a firm idea what Franklin would do if offered the USC job. I don’t know. You don’t know. Nobody knows. Except James Franklin, his wife, and at most one or two of his most trusted confidants. Don’t pay much attention to what Franklin says in the coming weeks, either. Coaches lie at this time of year when their names are mentioned for other jobs. They lie all the time, simply because they cannot tell the truth, in case the job offer doesn’t pan out and they have to stay put. So, if Helton is indeed fired, we’ll all probably be doing the little song and dance with Franklin where we ask him about USC, he tells us he’s happy at Penn State and we all just sit around waiting for a move to either happen or not happen. As I’ve mentioned, I personally would be surprised if Franklin would leave Penn State for USC. He’s a phenomenal recruiter, but his recruiting ties are primarily in the East, not the West coast. Franklin also signed a contract extension last year that will pay him an average of $5.8 million for six years. Helton’s salary at USC is $3.8 million, so that school would have to make a significant financial increase, on top of paying off Helton’s $15 million buyout. Franklin’s buyout is only $1 million, so if he does decide to leave at any point, that wouldn’t be a factor. Franklin has a lot of things going for him at Penn State, including elite-level recruiting, but this has been a bit of a trying year. 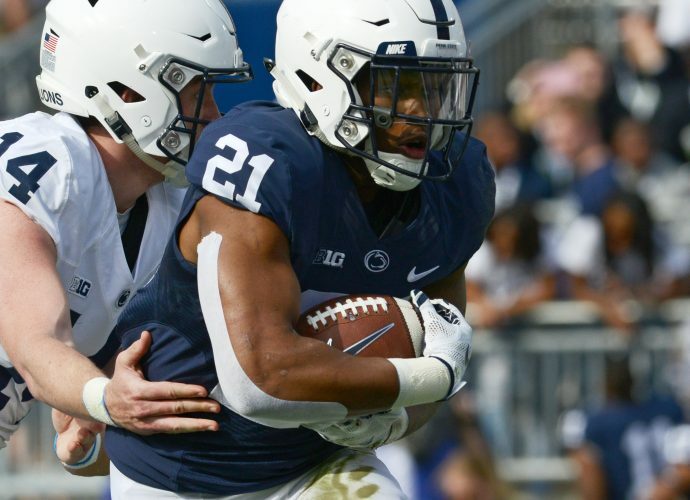 The Nittany Lions have underachieved, losing their three most important games in the Big Ten East, and there are no guarantees next year will be any better with quarterback Trace McSorley gone. So, if Franklin, who has been transient throughout his coaching career, were to decide he might want to move on again at some point, it’s conceivable this would be a possible time. But that doesn’t mean people won’t be speculating about it for the next few weeks. Another question asked this time each year is, what about Brent Pry? It’s become an annual thing for the Penn State defensive coordinator’s name to come up in connection with other head coaching jobs, and don’t be surprised if that happens again in the coming weeks. Pry has done a tremendous job this season. Without question. Penn State’s defense is better than anyone could have expected, and he deserves a lot of credit. Pry is very close with Franklin and has turned down chances to leave the past couple of years. But if the right offer comes along this time, or if he feels in any way that Franklin could be looking for a change of scenery anytime soon, then Pry may decide it’s finally time for him to take over his own program. Cory Giger covers Penn State football from the Altoona Mirror.